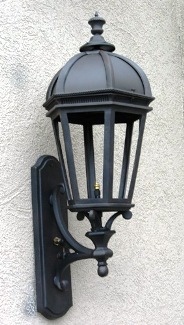 It is 10 3/4" wide x 27 1/2" tall with a projection of 11 3/4" from the wall and it is of wall mount gas type. It has same features like its genre bienvenue wall mount electric type with fine finishing and add the AIM 30 below to your cart along with this purchase and have an automatic ignition to your module. It has control valves for proper flame settings with right adjustments. Since it is of gas type, select the type of gas such as natural gas or propane as per your needs.